We can now provide a system that gives all of the benefits associated with a ‘2 Wire’ installation (less cable, quicker installation, cost savings on labour/product) and has the facility to â€˜I.D.â€™ the devices.The system is built on the proven communication protocol and shares the same platform as our largest, most powerful system. 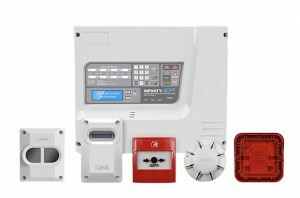 The Infinity ID2 can be used for new installations, as a retro-fit for any conventional system or as a replacement for existing 2 wire systems when the extra features are deemed to be desirable/necessary. This is possible because the Infinity ID2 devices sit on radial circuits, thus making it easy to â€˜upgradeâ€™ a system with the facility to I.D. devices without the need to rewire. Searching for high quality Fire Systems for your project?